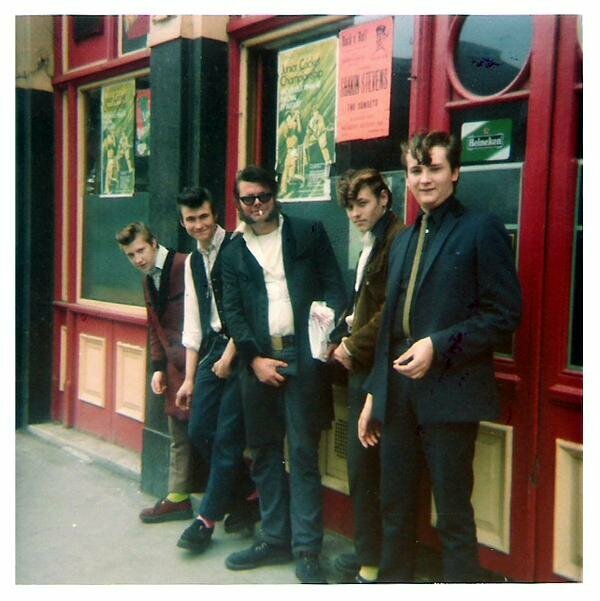 'Sunglasses' Ron - 'King of the Teds' - the greatest modern day ambassador of Rock 'n' Roll and the Teddy Boy Movement. 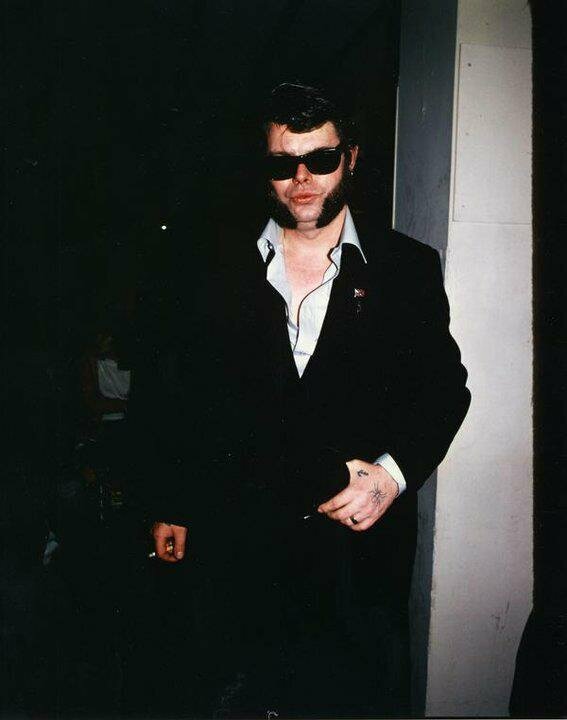 Born in 1944 and originally from Newport, Wales, Ron Staples-Fahey moved down to London in the early 1970's and would become one of the most legendary, notorious and most renowned Teddy Boys of all time. Ironically, he was first seen by the London Teds in The Black Raven pub in Bishopgate Street dressed as a Hippy wearing a Kaftan coat. The Black Raven was the main Central London Teddy Boy pub between the late 1960's until it passed into legend on 16th August 1975. It was owned by Rock n Roll enthusiasts, Bob & Eve Acland. The Black Raven was frequented by well know Teds such as Rocola Ray Flight, Pete (Spot) Lambert, Bob Plumb, Billy Johnson, Brian Savory, Geordie Bill, 'Tongue-Tied' Danny Cheek, Tooting Ray Emery, Little John Williams, Mick Lennon and Tommy Hyde to name but a few. 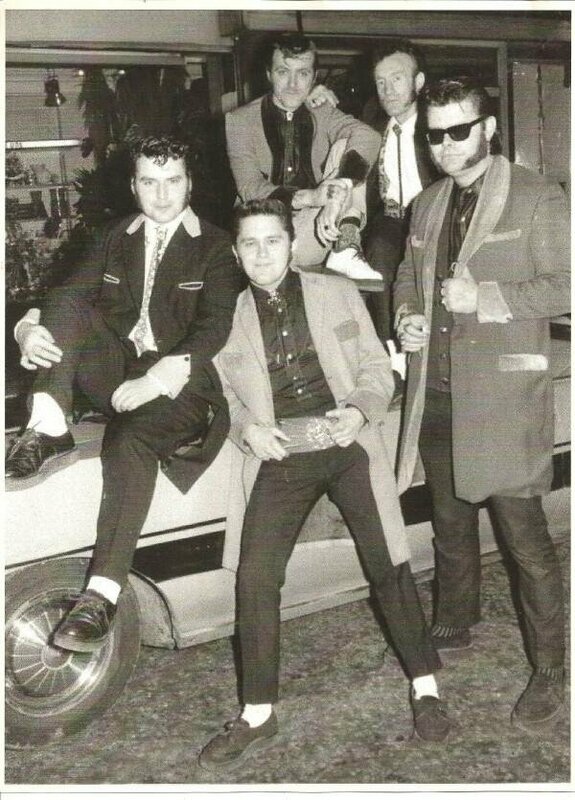 The Black Raven Teddy Boys were initially unconvinced of Ron's claims to have been a Ted in the late 1950's. Ron would have been 14 years old in 1958, so whether he really was ever a Ted in the late fifties remains debateable. 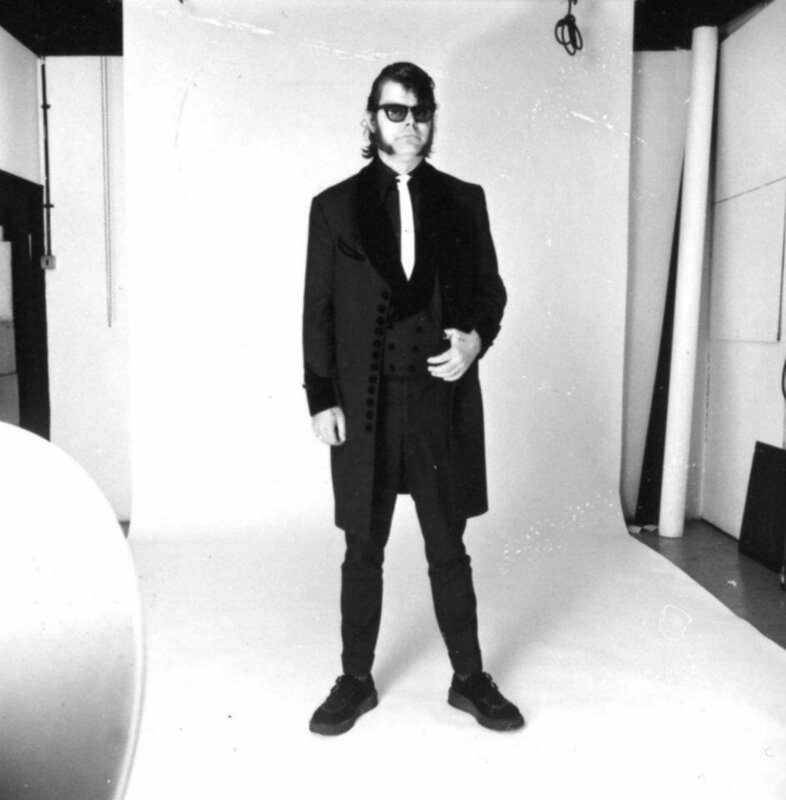 However, out of the blue, weeks later he re-appeared in full Teddy Boy attire for which he was later to be recognized - black drape, shirt & drainpipes - complete with sunglasses. This was the beginning of Ron establishing his credibility amongst the London Teds. Thomas (Gino) Charalambous, Steve Golly, Ron Staples, Norman Mascot, Rob and Del outside the Black Raven in Bishopgate in 1974. 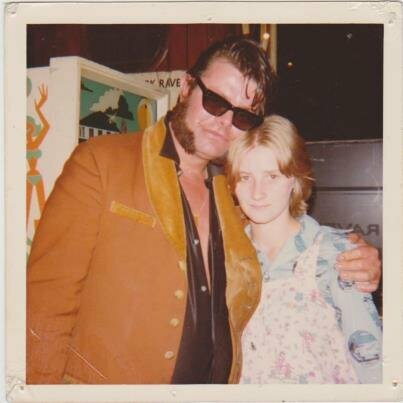 'Sunglasses' Ron Staples as he became known was acknowledged as a very friendly man who was softly-spoken and would help anyone out if he could, he may perhaps also have been regarded as being a bit of a con man, but nevertheless most people couldn't help but like him. He was 6ft tall with a huge grin, a rich chuckle with a great sense of humour. On first meeting him people would not be blamed for feeling a little in awe of him. 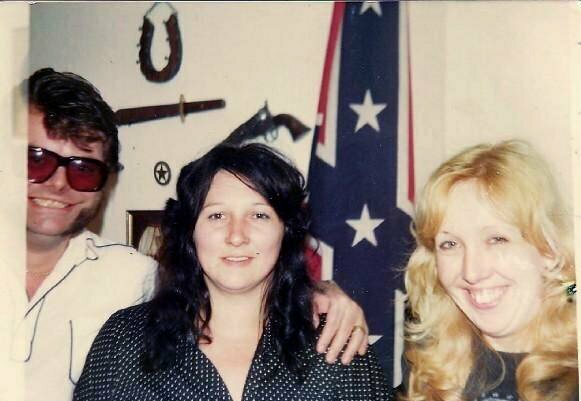 Ron looked intimidating, with his huge bulk, the tattoos and those evil dark glasses. Then his face would split into an enormous grin, his mouth like a Halloween mask and his voice a fascinating mixture of Welsh arid West Country, punctuated with a rich chuckle. By 1976 Ron had developed such a presence and made such an impression on the London Ted scene and nationally, that he was regarded as the self appointed King of the Teds in the UK. In the States they called him 'President of the Confederate States of America in exile. An archivist, administrator, rebel and veteran of the first post-war teenage cult. A quote says 'He was the only Ted I know who had an Equity card and needed it, because he appeared in the films 'Buddy' and 'That'll be the Day', he was even given a mention in a Christmas episode of 'Only Fools and Horses'. The Committee of the CSA - Johnny Key (West Ham John), Terry Grieves, Ray Emery (Tooting Ray), Ron Staples (Sunglasses Ron) and Ray Flight (Rockola Ray) taken in the Castle, Old Kent Road, South London, circa 1974. He was a fascinating raconteur and as he knew everyone on the scene, had an endless store of hilarious stories about them. There is a very successful entrepreneur still on the scene today, whom he remembered well from the early days. His comment on this character was "He's been a piss artist from the day I first met him." Clue: the guy is very tall and Welsh. Some of Ron's stories needed to be taken with a large sack of salt. For example, according to him, the only person who got paid on the unforgettable "Sun Sound Show" at the Rainbow in London was Jack Scott, who had a Mafia representative with him to ensure that he did get his money. Is that story true?, well who knows. 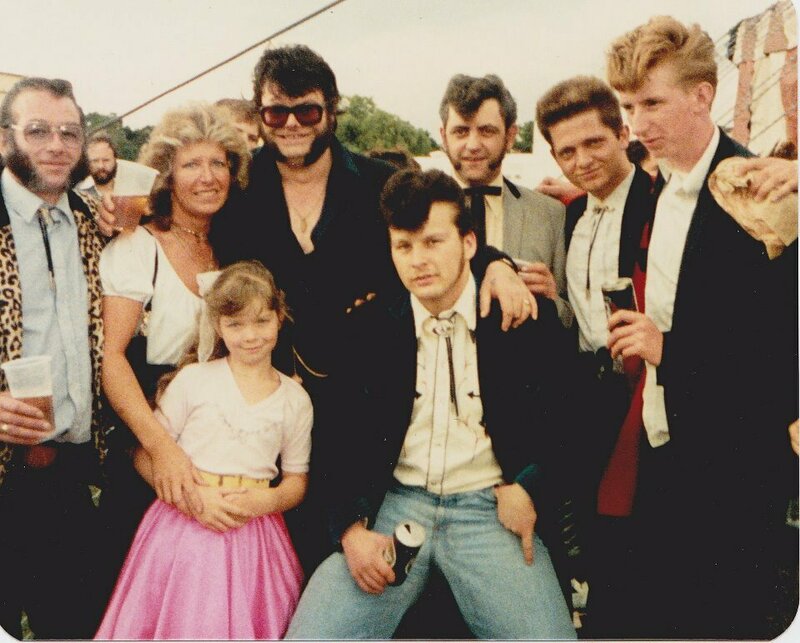 Part 6 of 6 of a Rockabilly documentary from 1981 produced by Janet Street Porter with Danny Baker narrating. 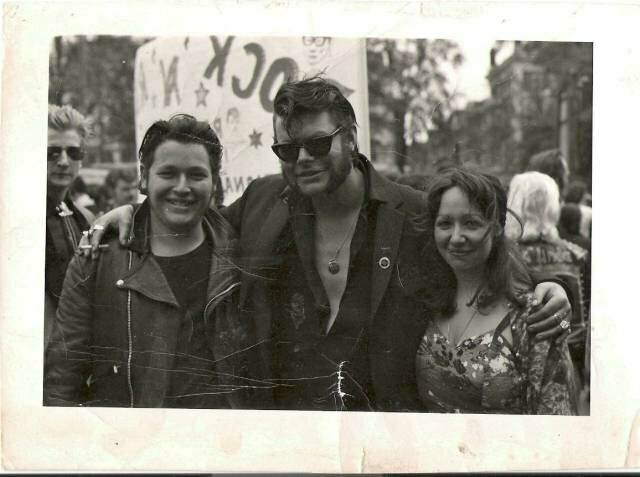 Part of a series of 20th Century Box programmes on youth sub cultures with some great footage which really captures the spirit of the London Rockabilly scene at this time - this features 'Sunglasses Ron' who coments on what is happening to the Rock' n' Roll scene at the time. Someone recalls a time, at a big Rock 'n' Roll show in Salford, Lancashire. Ron came up to me looking very embarrassed, he drew me aside, dropped his voice and said, "Can you do me a favour, mate. I'm trying to impress some big record executives over there but I've no money to buy them drinks. Could you possibly lend me some". The guy concerned did so, but thought, "You poor bugger, you're probably the best-known face on the rock 'n 'roll scene and you haven't got enough cash to buy drinks. There's something wrong somewhere!. Those who hated or despised Ron (and there were plenty, as he ruefully admitted) will probably seize on stories that he was a useless scrounger and a lay-about. However, it has to be said that Ron helped many people in countless ways, although none of them to do with money, that so many were happy to help Ron in return. Indeed, many, of course, thought that Ron was a piss-artist, a conman, and a publicity-seeker, who used the Teddy Boy and Rock 'n' Roll scene for his own ends. Others did seek his 'King of the Teds" nickname, for example one London Ted used to asked him by saying, "Ron, can I be 'King of the Teds' this week?". Instantly recognisable, this "Large, friendly person", as one of the pop papers aptly described him, made friendship his main hobby, next to Rock' n' Roll and the Confederacy, of course, another one of his enthusiasms. Ron at Marble Arch on the 'March to the BBC' with Nigel Stark and his Girlfriend, Joan. Ron did an awful lot to further Rock 'n' Roll nationally, including taking part in the famous March to the BBC's on Saturday 15th May 1976 with 6000 other Teds and Rock 'n' Rollers campaigning for Radio One to include a Rock 'n' Roll slot on the radio. 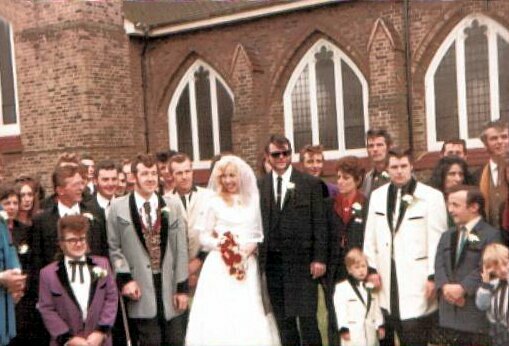 Eventually Ron got married on 30th June 1979 to Jill at a well attended Teddy Boy Wedding. In the early 80's, Sunglasses and his wife, Jill, lived in Forest Gate in East London, in a small house, part of a terrace that ran parallel to the railway line a short stagger away next door to a pub. Truly, a drinker's dream. Ron, Mo Johnson and Jennifer at Mile End. Most people were surprised to learn on his death that he had nine children, but as he once told someone that he had managed to juggle three girlfriends at once at the Fishmonger's Arms by the simple expedient of meeting one in one bar it 7pm, the second at 8pm in another bar, and the third at 9pm in another bar, it figures. 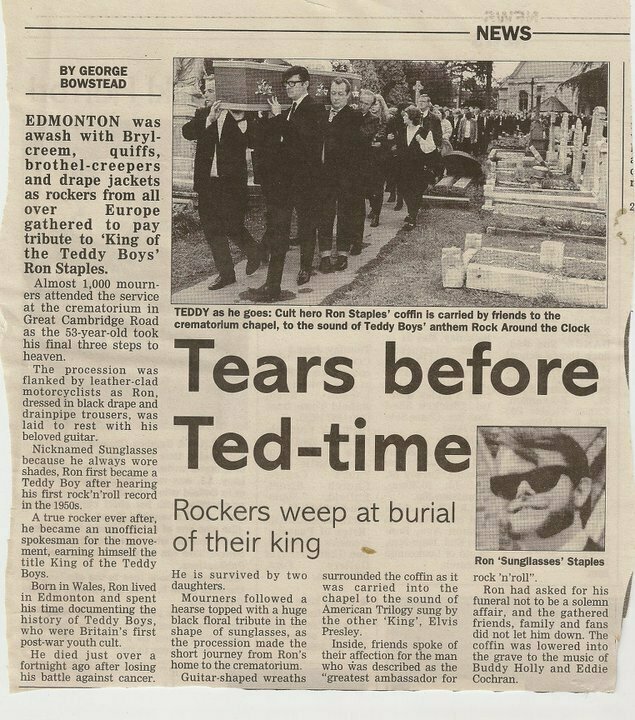 This is a clip from the 1995 Teddy Boy Weekender which features Sunglasses Ron along with Black Raven, Tartan Ted, 8-Ball Paul, Robbie The Ted, Redneck, Brian Rushgrove. Many well known faces of the Ted Scene at the time. With great sadness, 'Sunglasses' Ron was laid to rest on the 22nd of May 1997, following his death ten days previous after a long battle against cancer, at the tender age of 53. Those who attended the funeral will remember it was an occasion Ron would have been proud of, with the music of Rock 'n' Roll, Elvis Presley's American Trilogy, Buddy Holly's Rave On and Eddie Cochran's Three Steps to Heaven, sending him off. As the procession, lead by a leather clad undertaker, and including many bikes and hundreds of Teds walking behind the cars, arrived at the Crematorium, Rock Around The Clock started up with people breaking out in a jive in front of the lead car. This funeral created a long lasting memory in the minds of everyone who knew Ron. Alongside all Ron's friends and relatives were press reporters and photographers and a television crew all covering the funeral? Ron could almost have been royalty, in fact he was billed as the most famous Teddy boy in the world. Inside the chapel where Colin Pryce-Jones (of Rapiers fame) presided over the proceedings, a Capital Gold DJ said: "He was the greatest ambassador for Rock and Roll and now he's up there with the greats. Thanks Ron you were a diamond." Ron's last words were taped and played over the speakers at the church "Tell them how much I love them and tell them it better be a bloody good piss up". And it was, Ron well and truly had his last wish come true. So what was Sunglasses Ron's contribution to Rock 'n' Roll and the Teddy Boy movement?, after all, he never wrote or performed a song, edited a magazine, put on large shows, ran a fan club (except for himself, as some cynics have suggested). Well, the fact is that he contributed himself was in itself a good advertisement for the fun and friendliness of the Teddy Boy and Rock 'n' Roll scene. He was a benign ambassador for all that was best in the music and its fans. He had no successor and it is inconceivable to think that there will ever really be one. 'Boppin' Bill's Regimental Re-union' (London Evening Standard) with left to right: Chip, Billy Johnson, Andy Tuppen, Pete (Spot) Lambert and Sunglasses Ron outside the Lyceum in London on October 15th 1975 following concert with Hellraisers and Rock Island Line.